In a dramatic turn of events the investigation into the murder of Lasantha Wickrematunge, the CID questioned Field Marshal Sarath Fonseka yesterday. Colombo Telegraph recently commented as to why Field Marshal Sarath Fonseka and former Secretary of Defence have not been questioned in regard to the above mentioned murder. According to Field Marshal Fonseka, he was questioned for five hours by the CID yesterday into the Lasantha Wickrematunge murder. Participating in the Sirasa Satana programme Field Marshal Sarath Fonseka confirmed that he was questioned by the CID into the Lasantha murder investigation. 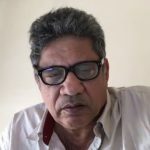 He went on to suggest that it was Gotabaya Rajapaksa who would have been behind the murder of Lasantha, as the journalist was about to reveal more into the corruption involved with the MiG aircraft purchase. Field Marshal Fonseka also stated in the programme which is available for viewing on Youtube that the security of Colombo was in the hands of Gotabaya Rajapaksa who used Gen. Hendawitharane for this purpose. Special emphasis was laid on the White Van Abduction culture in Colombo. Field Marshal Fonseka went on to say that late Lasantha’s brother Lal Wickrematunge was paid money by the Rajapaksa’s to lay the blame for the murder of his brother on him (Field Marshall Fonseka). CT: Did you listen to the Youtube interview on Sirasa Satana programme where Field Marshal Sarath Fonseka spoke of your brothers murder? CT: He accused you of taking money from Rajapaksa to blame him for your brothers murder. LW: This is not the first time Field Marshal has said that I have accused him of Lasantha’s murder. He has said this many times before to local media persons and even the BBC. CT: Did you accuse him of the murder of your brother and if so, what evidence do you have? LW: I have never accused him. CT: Then on what basis is he saying that you did? Why have you not said that you did not accuse him prior to this? 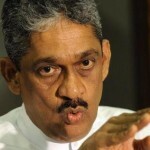 LW: Field Marshal Fonseka has not listened carefully to what I have said on many occasions. I have spoken at Lasantha’s memorials as well as in some of my articles written and published in newspapers as well as on TV stated that former President Mahinda Rajapaksa told me three times that it was Sarath Fonseka who killed my brother. I DID NOT SAY THAT. It was the FORMER PRESIDENT who told me that not once but three times. Field Marshal Fonseka is most welcome to go back to such interviews and articles to satisfy himself. There is a distinct difference in my saying and someone else saying such to me and my repeating it. CT: Did you tell the CID this? LW: Yes. When I was asked in the course of recording my statement. CT: Field Marshal accuses you of taking money from the Rajapaksas to do so. LW: ( Laughs) The Rajapaksas hated us. I won’t dignify such accusation with an answer. Perhaps Field Marshal Fonseka thinks that Rajapaksas bought The Sunday Leader and paid me additionally too to say such things. The sale of the newspaper was done three years after Lasantha’s murder and it was Asanga Seneviratne who bought it. That too the money has not been paid to complete it as yet. I have sent a letter of demand to him. CT: Why did you not take these issues up before this? LW: I did. You must not forget that it was the Rajapaksa regime that was in place when Lasantha was killed and thereon up to 2015. I had a lawyer representing the family in the Magistrate’s Court. We wanted the investigation transferred to the CID instead of the TID which was being used to deflect the direction. It took time to do so and in fact it was only after there was a regime change that it was done and the investigation pursued. 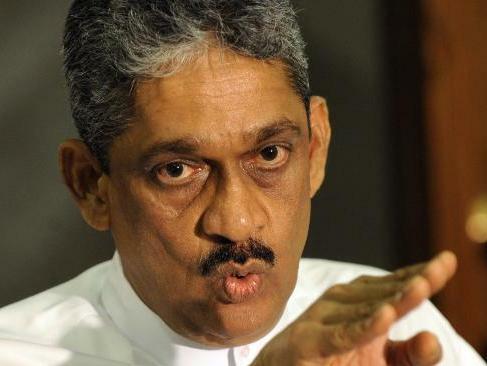 CT: Your newspaper supported Gen. Fonseka at the Presidential election. So, why does he accuse you now? LW: It was a policy decision to support Fonseka at that election. The newspaper had been taken to Court by Gotabaya Rajapaksa, former President had also been abusive to Lasantha, me and others in the staff. In addition to the Press being burnt, the corruption that was prevalent at the time and finally the murder that made us decide. But I did ask Gen Fonseka also whether he knew who killed Lasantha before making that decision. CT: What did he say? LW: The first occasion was when he had made the decision to retire and was expected to be the common candidate. It was a press conference at the Taj Hotel. A Rotary organised one. He was on stage and I was in the audience. I sent him a scrawled note asking “Who Killed Lasantha?”. When it was his turn to speak, I think he was the keynote speaker, he said it was “kudukarayas masquerading as politicians who did it and he had no time as all his energy went to the war”. The second was when he had decided to run as the common candidate and the UNP lawyers held a meeting at Galadari Hotel where three lawyers who had passed away were garlanded. There too I sent a note to the stage and his response was the same. The third occasion was when the newspaper did an interview with him at his Reid Avenue political office just days before the election. His answer this time directly to me was the same as before. CT: Who was he speaking of? LW: At that time I thought he meant Mervyn Silva. CT: What do you think now? LW: I think he has spoken clearly as you can hear on the Satana show. CT: Why did you not take it up in Courts through your Lawyer if the former President accused Gen Fonseka and said it to you? LW: I asked the former President directly when he said such as to why he as Head of Defence does not go to Mt Lavinia Court where Lasantha’s murder was being heard and say that. LW: He mumbled something about evidence and the Army being demoralised. But I do recall after one such time when I spoke at Lasantha’s grave site and the BBC was present covering it, they asked Gen Fonseka what he had to say. There too I said that former President told me that it was Fonseka who killed Lasantha which prompted them to ask Gen Fonseka for a response. At the time he told the BBC in response it was Gotabaya who was responsible but also found fault with me too. Obviously he was out of step then too and did not understand what I was saying. Come on, this was the President of the country saying his former Army Commander killed Lasantha !! What did he expect me to do? I took it as a responsible statement and Gen Fonseka should have addressed the former President and not me. CT: Do you know what he said to the CID in his statement? Would he have said what he said at the Satana interview? LW: I don’t know. I sure wish he has said what he knew to the CID. I also hope the CID follows up and even question all those who said they knew who killed Lasantha. CT: So, did you say it was Gen Fonseka who was responsible? Who do you think was responsible? LW: I have never said that. I do not know why he ( Field Marshall) thinks so. Perhaps he thought I believed what the former President said. Why should I believe him if he wasn’t prepared to say it to the CID or Court? Nevertheless I had to say that he did tell me such a story. I do hope some good will come out of this which will lead to unravelling the case into my brothers murder.